I was in Pokhara, on 25th April 2015, the day the first of two big earthquakes struck Nepal. Pokhara is just west of where the epicentre was located that day but fortunately there was no serious physical damage, but I could really feel it! I was terrified and knowing that for so many people the continuous aftershocks were now a reality, not just an unfortunate incident on a trip, made me determined to try to help. It was on the bus journey back to India, a week later, that I decided I wanted to use my expertise to raise money for the long-term rebuild, having felt pretty useless while we were in the country. 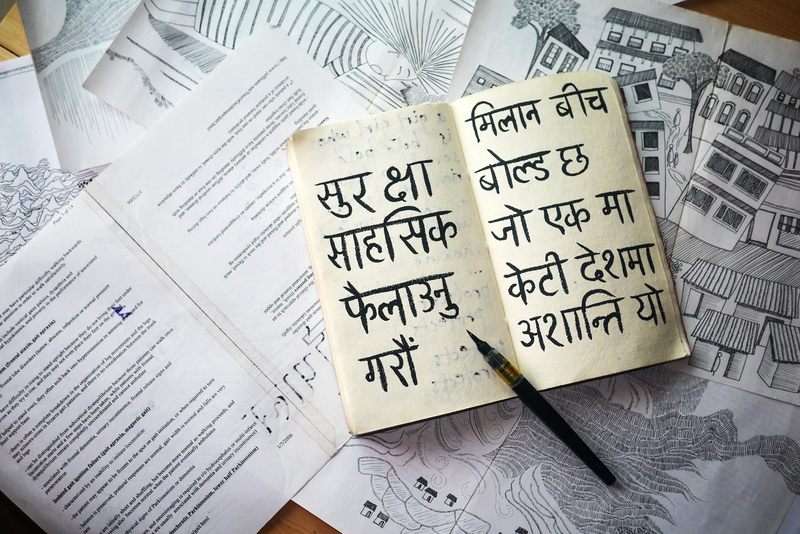 The idea of writing and illustrating a short story developed and came to life as I continued my diverted journey, influenced by Sri Lanka, India, Japan, South Korea, China and, of course, Nepal. 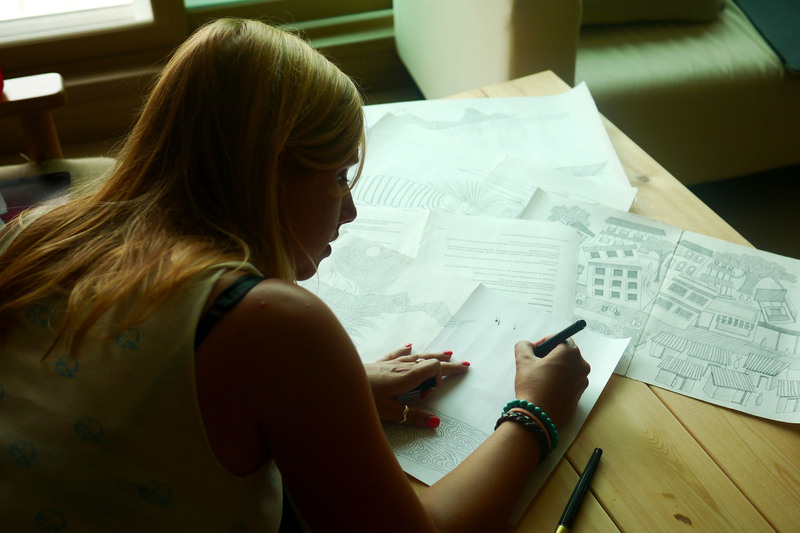 Most of the drawing was done in Japan, over the next few weeks, in any situation that I could adapt into a drawing space; in train stations, on trains, in hotel rooms, on the beach. It’s all added to the character. I was also pretty adamant that I wanted to use found materials as much as possible, to make it part of the journey. I’ve used recycled printer paper from our lovely guest house owner in Allahabad, drawing pens from London and Tokyo, a calligraphy pen to write the story from Kawaguchiko by Mount Fuji. 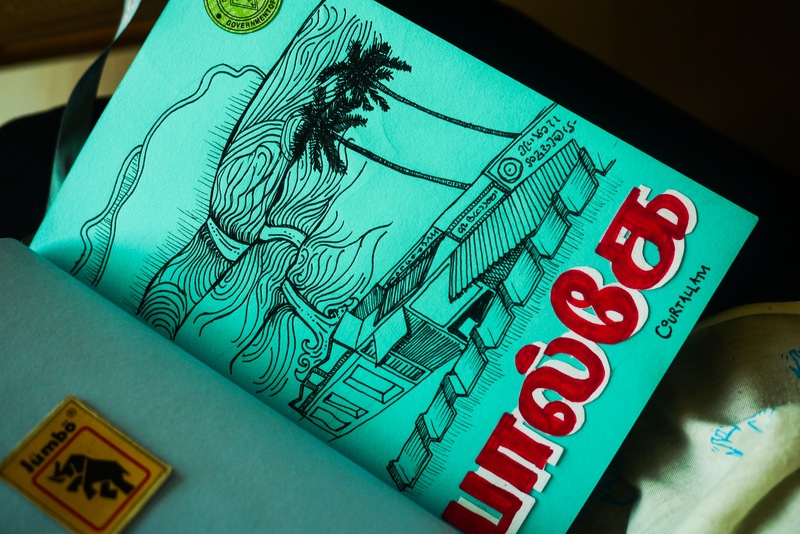 I’ve sketched on the back of maps and plane tickets, plus some beautiful Japanese fabric paper, and the illustration style had developed during my time in Sri Lanka and India, unknowingly it seems, for this purpose. So basically it’s a melting pot, a mish mash, an amalgamation of experiences, all pasted together and I hope this is what makes it unique. When all the drawings were complete I decided to run a kickstarter campaign to raise money for all the production costs of a book, a t-shirt and a poster/print created from the illustrations I had done. I wanted every single penny I raised to go straight back to Nepal. 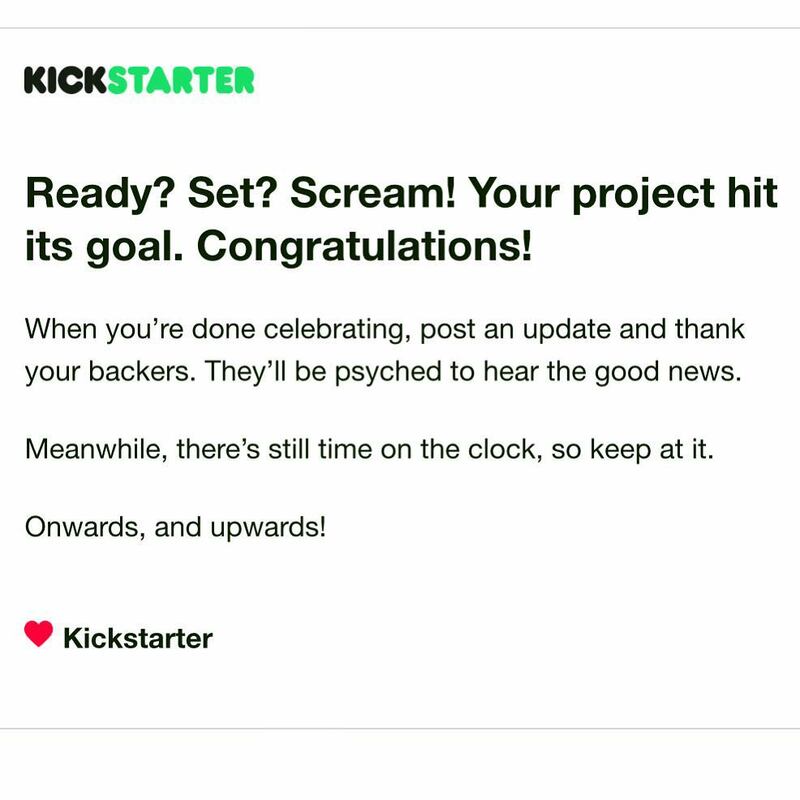 https://www.kickstarter.com/projects/1149331676/the-country-that-shook/description The goal was reached and to our surprise went way over the £2200 that I needed. I ended up with a total of £3075 from 106 backers, which allowed me to print 1250 books, rather than 1000, 100 T-shirts, and 150 prints that will be sold to raise money for Nepal. 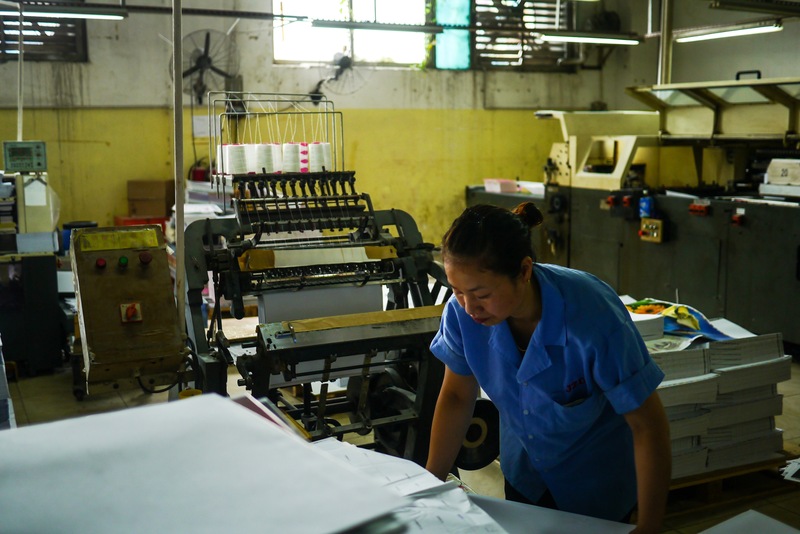 In the meantime I contacted book printers in China, our next destination, and selected Gold Printing, a company who were particularly helpful, spoke great English and provided me with a competitive quote. We went in to meet them in Shenzhen, southern China, and collected the sample of the book and poster that I had requested. We also visited the factory where the book would later be produced which was a great experience. 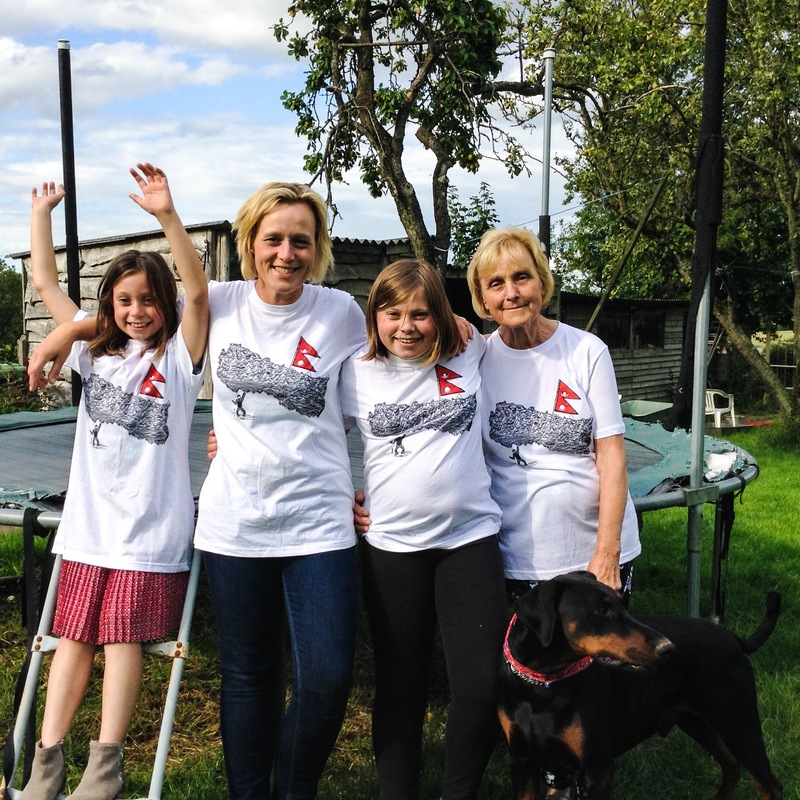 The limited edition screen printed T-shirts were produced on The Isle of Wight. 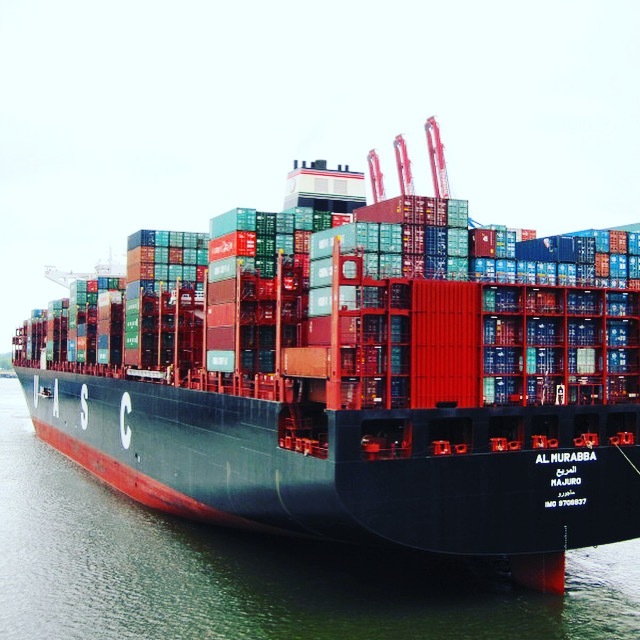 Once printed the books and the posters left China bound for the UK on a cargo ship, the AL MURABBA. They docked in Felixstowe on 21st October 2015 and made their way to my parents’ home in Thatcham. My family are helping me to distribute them to buyers from all around the world. The pre-order was launched on Sunday 25th October 2015, exactly six months after the quake. Kickstarter pledgers received their rewards first, then the orders started to flow out. The books are also being sold in selected independent bookshops around the UK. In the first two and a half months the project raised £3,500. By June 2016 that total had risen to £7,300, all from sales of the books, t-shirts and prints. 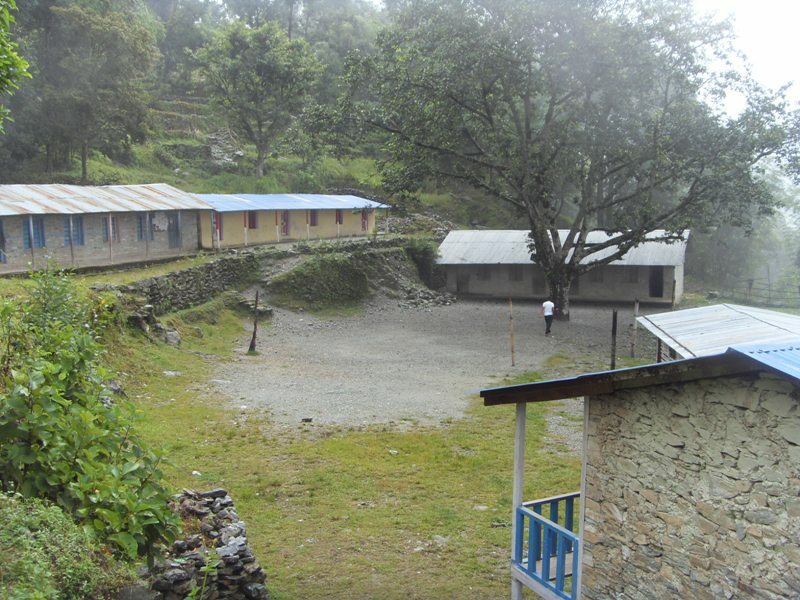 The Country That Shook partnered with The Gurkha Welfare Trust (registered Charity number 1103669) to support Shree Barbot Lower Secondary School which is in Solukhumbu, east of the epicentre. During the earthquake it sustained serious damage and the remaining buildings were very unsafe. The Country That Shook partially funded the rebuilding of a four classroom school on this site. The £10,000 donated up until the end of 2016 paid for two of the classrooms and a toilet block. Building work started in early 2017 and was completed just before the monsoon rains began in May 2017, which is incredibly important. All building supplies were carried from the nearest road by donkeys and mules. Another £2,500 donated has paid for school supplies, such as desks, chairs and other equipment. In April 2018, almost exactly three years since the earthquake, Sophie was able to return to Nepal, visit the finished school and attend the opening ceremony! There are still more books to sell, so this journey is not over yet. If you have any ideas about how to publicise it further please get in touch, I’d love to hear from you!